The game at Elland Road back in March will go down as one of Town’s greatest victories at the home of our rivals, and it was still fresh in the memories of both sets of fans. The clubs are currently miles apart both on and off the field, with Town taking 13 points from their first five games, whilst Leeds have managed just 4. As any Town fan knows, this wasn’t going to be an easy game, with form going out of the window for the derby, and Leeds expected to raise their game. David Wagner made two changes to the Town side that won 1-0 against Wolves, with Palmer and Wells dropping out for Payne and Bunn. Town were supported well again, with a third successive sell-out away following – this time, just shy of 3000 fans made the trip to support the team. Town looked to dominate the game from minute one and had their usual hefty amount of possession throughout. The first good effort of the game came on the half-hour mark, when Mooy had a shot from distance that flashed narrowly wide of ex-England goalkeeper Rob Green’s post. In truth the first half was very tight with not many chances of note from either side, but Chris Wood’s header from the home side has to go down as a missed opportunity. A cross found him unmarked in the box but his header went just wide. The half time break didn’t bring about any changes from either side, but ten minutes into the second half, the Terriers took the lead. Jack Payne excellently controlled a high ball, and found Aaron Mooy over 20 yards out, who smashed the ball into the top corner. The Elland Road away end was sent into raptures for the second time in a matter of months, as Town led in the derby! From this point in the game Leeds opened up more, but Town defended resolutely, apart from one Wood header that Danny Ward dealt with comfortably. Instead, there were more holes in the Leeds team, with substitute Kasey Palmer firing just over the bar, and Van la Parra almost catching Green out from 35-yards. Despite 8 minutes of stoppage time, Town saw the game out to claim another win at Elland Road, and a fifth in the first six league games. This sent Wagner’s men four points clear at the top of the Championship, ahead of a tough trip to Brighton on Tuesday. 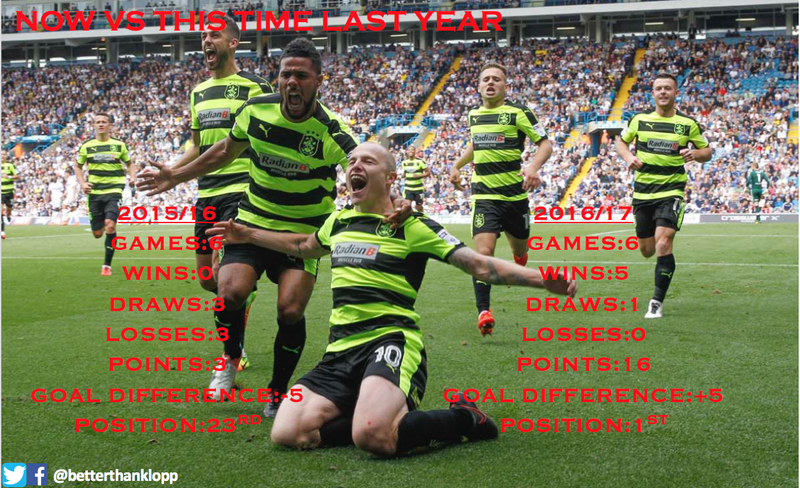 Previous Transfer Window: How Huddersfield Town got it RIGHT! Next Ward error costly as Brighton inflict a first defeat!